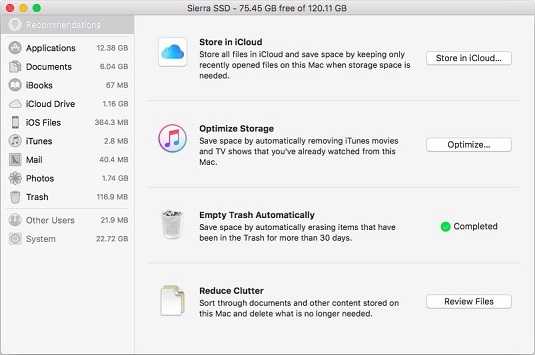 Sierra introduces a new feature called Optimized Storage, which provides assistance when your startup disk gets close to being full. Your Mac will slow to a crawl when your startup disk gets close to full. If your startup disk is more than 90 percent filled, you’ll begin to experience slowness and jerkiness. And as the drive approaches 100 percent fullness, things grow even slower and jerkier. Optimized Storage aims to help you out as your disk fills up by scanning for duplicates, old email attachments, and downloads so you can delete them or move them to the cloud. But you should read what follows even if your disk isn’t approaching fullness right now, because Optimized Storage offers several options that may keep your disk from ever getting too full. To check it out, choose @apple → About This Mac, click the Storage tab at the top of the window, and then click the Details button for your startup disk. Store in iCloud: Click the Store in iCloud button if you want to store all of your files in iCloud to save space, keeping only recently opened files on your Mac when storage space is needed. This option could be convenient, but it’s going to chew through your 5GB of free iCloud storage in no time. With additional iCloud storage currently selling for $2.99 a month (200GB) or $9.99 a month (1TB), it could be costly as well as convenient. Optimize Storage: Choose this option to remove from your Mac movies and TV shows you’ve already watched. Erase Trash Automatically: Choose this option to automatically empty files that have been in the Trash for 30 days. Reduce Clutter: This option lets you review and delete older documents, which are broken down by category — Applications, Documents, iBooks, and so on — along the left side of the window. If your disk is getting full, use one or more of these Optimized Storage tools. The bottom line is that you don’t want your startup disk anywhere close to 100 percent full, and Sierra’s new Optimized Storage features provide four useful ways for you to stay on top of and avert trouble before it even occurs.